Two remarkable features of Windows 10 are Cortana and Microsoft Edge. 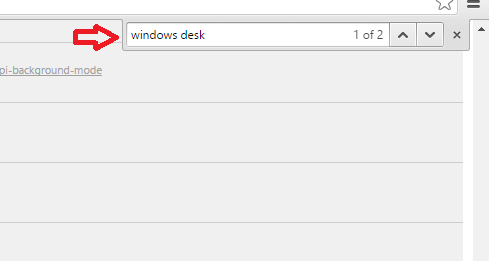 The Cortana bar gives you web search options as the search result of the keywords you type. And Microsoft Edge is the new search engine by Microsoft. So when you search something in the Cortana bar of your Windows 10 device, if it is a web search, the result is shown in Microsoft Edge by default. Windows 10 redirects all the web searches to Bing. If you are not a fan of Bing search or the Edge browser, you might find this less interesting. You can turn this feature off if you want. As Microsoft Edge is a relatively new browser, there are many functionalities that are not available. And further, most of us may be more familiar with Chrome browser and Google search engine. It is not always easy to launch the Google Chrome browser each time you wish to search something on the web. Hence we would prefer searching something on the Cortana bar. Now if you wish to have your Windows 10 web searches redirected to Google instead of Bing, read this post and carefully follow the simple steps shown below. Type chrome://flags/ in the browser tab. This opens the chrome flags. 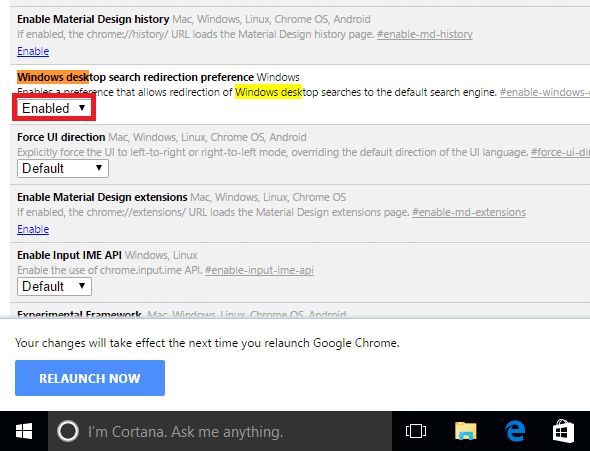 Press Ctrl+F (find option) and type windows desktop search redirection preference. Change it as shown in the image to change the default browser. Click on the RELAUNCH NOW button. The changes will take effect after the relaunch. Now set default search engine as google in chrome and now all web results will open in google. To know more about the functionalities and features using Chrome flags, click here. One thing you must know is that the features in flag are temporary. They may crash, change or vanish at any time. Since flags are experimental features, they are not always reliable. You can always reset the changes you have made using Chrome flags by using the reset to default option that is provided. If you are disappointed at the fact that flags are unreliable, don’t worry. Here is an alternative. Google has an extension called bing2Google. bing2Google redirects your web searches on Windows 10 search bar from Bing to Google search engine. Install bing2Google extension on your device. The next time you search something in the Cortana bar, your result will be redirected to Google Chrome. And Google will perform the search instead of Bing. And to add, Firefox can also provide the results for the web search you perform on Windows 10 device.